Perfect Performance: The EV2430WS has charged my Leaf flawlessly since it was installed. I basically charge once a day, so that's 120 times I've used it with 0 defects. Having a reliable charging station is very important to an EV driver...because if my car isn't charged when I expect it to be, I won't be a happy guy. Like most residential EV Chargers, the EV2430WS is simple to use: you simply plug it into your car when you want to charge and pull it out when you're finished. 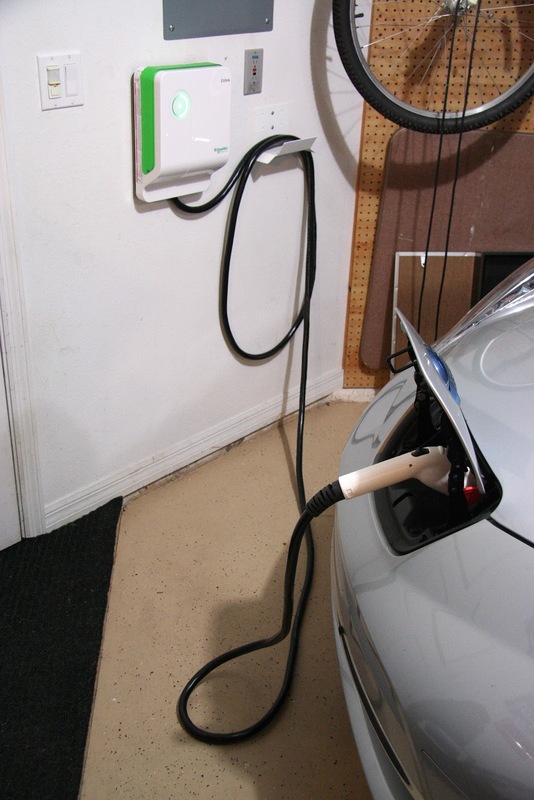 It's that easy - you don't need to press any buttons on the EVSE ever. Given that many there are many standards governing the operation of Electric Vehicle Supply Equipment (EVSE), they should all nearly work the same. Since the Schneider EV2439WS is UL Approved and is J1772 Compatible, it's safety and basic functionality are basically guaranteed. Favorite Feature: Perhaps the best feature of the EV2430WS is the user interface. In one simple display, it allows you to see how many hours your car has been charging, shows you warning lights, allows you to delay the start of charging, and allows you to manually stop the charging process. 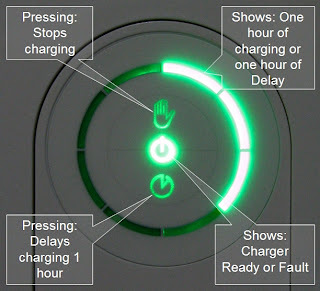 Each segment of the lighted circle around the display represents one hour of charge. As you can see in the picture, the Leaf has been charging for 3 hours. For cord management, the EV2439WS includes a simple powdercoated rack to store the cord. a. Did you install this yourself or hire an elecrictian? b. What was the cost of the unit, installation disposables/supplies, and labor (if an electrician was hired)? I used an electrician (Palmer Electric) to install mine...because I worked there. 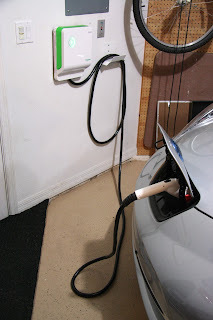 The price for the EVSE was $800 (same has Home Depot) and the installation was $200...so $1000 total. Most of the residential installations fall between $200 and $300 for Central Florida homes (no service upgrade required). If you're OK with wiring a dryer outlet up, then you can install an EVSE...it's not hard if you know what you're doing. I also bought this unit, but from Lowes, for $799 (free shipping). I got a quote from a local electrician to do it for $750. I balked, got the 8ga wiring ($65) and a 40amp breaker ($15) and did the job myself. It took me 3-4 hours and I had to climb in a nasty hot attic, but it was not too difficult. You have to have a wire cutter/stripper and a few other basic tools (drill, screwdriver, hammer) to route and secure the wiring and mount the unit. I have seen one from a friend in long island toyota. He has an electric car so he bought one so he could charge at home instead of going to charging stations. This is a good unit, it has worked well in our shop. Price at Home Depot web site has come down to $749. This is a great deal. Looks like that is a great charger to use for newer EV's. Is it also integrated for use with other car makes (like toyota and hyundai maybe)? Nice looking accessory!Is it really adaptable for use anywhere, and with any kind of electric vehicle?